A joint program by NASA, the Air Force, the Navy, and North American operated the most remarkable of all the rocket research aircraft. Composed of an internal structure of titanium and a skin surface of a chrome-nickel alloy known as Inconel X, the X-15 had its first, unpowered glide flight on June 8, 1959, while the first powered flight took place on September 17, 1959. Because of the large fuel consumption of its rocket engine, the X-15 was air launched from a B-52 aircraft at about 45,000 ft and speeds upward of 500 mph. The airplane first set speed records in the Mach 4-6 range with Mach 4.43 on March 7, 1961; Mach 5.27 on June 23, 1961; Mach 6.04 on November 9, 1961; and Mach 6.7 on October 3, 1967. 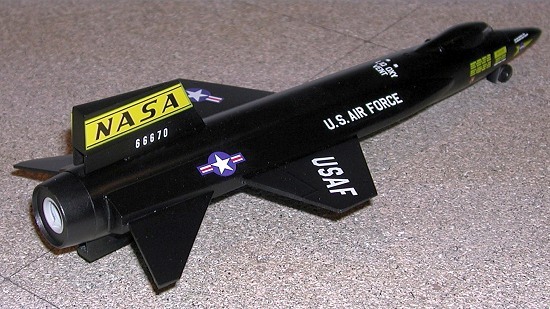 It also set an altitude record of 354,200 feet (67 miles) on August 22, 1963, and provided an enormous wealth of data on hypersonic air flow, aerodynamic heating, control and stability at hypersonic speeds, reaction controls for flight above the atmosphere, piloting techniques for reentry, human factors, and flight instrumentation. The highly successful program contributed to the development of the Mercury, Gemini, and Apollo piloted spaceflight programs as well as the Space Shuttle program. 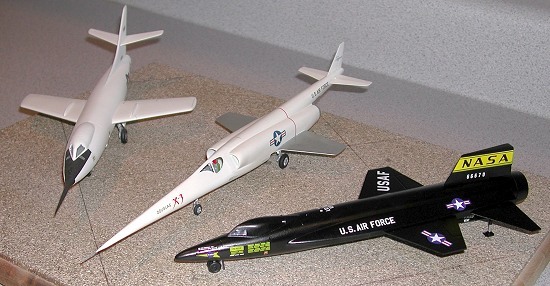 Revell’s X-15 kit was originally released in 1960’s; with a re-releases in 1982s History Makers series. The kit is an odd, “fit-the-box”, 1/64th scale. The kit contains 37 parts molded in black and clear plastic, and contains a pilot figure. Notably, this kit has no panel lines. This kit recalls the days when model kits were more perceived as toys rather than what we consider model kits as today. This kit has moveable landing gear, working speed brakes, a removable canopy and removable rocket. All of this I chose to glue in place. As with all early scale model kits from that era, the plastic is thick, the parts don’t line up quite right, and some filling and sanding is required. There were some sink along the spine on both sides of the fuselage, but nothing that filling and sanding can’t fix. I got lucky with this kit, there were no major problems. The only fit problem I had was the fit of the moveable landing skids and the speed brakes. As I stated earlier, I glued all the moving parts in place, filled and sanded them. I originally put the long probe on the front of the aircraft, but after looking at some X-15 pictures on the internet, I decided against that and cut it off and sanded it to shape. Besides, it would save me frustration later should it had ever broken off. 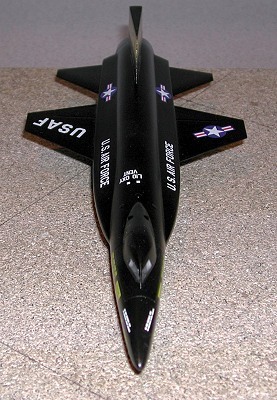 This X-15’s was painted an overall black. I painted the entire model with several coats of Testors flat black. After the paint had thoroughly dried, I applied a few coats of Glosscoat. The kit decals were in pretty nice. Not a bad decal sheet made in 1982. The decals took right to the gloss surface with no silvering. I impressed myself with the decal job. I got this model as an addition to my other vintage Revell kits. This was a another fun build. I like building old vintage kits, especially these old Revell kits and taking the time to make them into something really nice. Next project, finishing Revell’s X-3 kit to complete the collection!